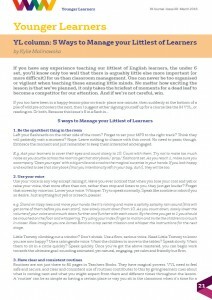 If you have any experience teaching our littlest of English learners, the under 6 set, you’ll know only too well that there is arguably little else more important (or more difficult) for us than classroom management. One can never be too organised or vigilant when teaching these amazing little minds. No matter how exciting the lesson is that we’ve planned, it only takes the briefest of moments for a dead leaf to become a competitor for our attention. And if we’re not careful, win. Left your flashcards on the other side of the room? Forget to set your MP3 to the right track? Think they will patiently wait a moment? Nope. Leave nothing to chance with this crowd. No need to panic though. Embrace the moment and just remember to keep them interested and engaged. E.g. Ask your learners to cover their eyes and count slowly to 10. Count with them. Try not to make too much noise as you scuttle across the room to get that storybook/ prop/ flashcard set. As you reach 1, make sure you accompany ‘Open your eyes’ with a big smile and a nod to the magical surprise in your hands. If you look happy and excited to see that storybook (that you intentionally left in your bag, duh! ), they will be too. Use your voice in any way except raising it. Have you ever noticed that when you lose your cool and yell or raise your voice, that more often than not, rather than stop and listen to you, they just get louder? Forget that screechy voice too. Lower your voice. Whisper. Try to speak normally. Speak like zombie or robot if you so desire. Just anything but yell or screech, please! e.g. Stand on tippy toes and move your hands like it’s raining and make a splishy splashy rain sound (this will get some of them before you even start), now slowly count down from 10. As you count down, slowly lower the volume of your voice and crouch down further and further with each count. By the time you get to 1 you should be crouched on the floor and whispering. Try using your index finger to motion and invite the children to crouch in closer. Now imagine you are James Bond on a top secret mission and whisper the instructions for the next stage. Little Tommy climbing out a window? Don’t shriek. Use a firm, serious voice. Need Little Tommy to know you are now happy? Use a calm gentle voice. Want the children to move to the tables? Speak slowly. Want them to sit in a circle quickly? Speak quickly. Once you’ve got the above mastered, you can begin work towards the ultimate goal: sounding animated, yet natural, engaging, yet calm and friendly but firm. Routines are not just there to fill pages in Teachers Books. They have magical powers. VYL need to feel safe and secure, and clear and consistent use of routines contributes to this by giving learners cues about what is coming next and what you might expect from them and different times throughout the lesson. A ‘routine’ can be as simple as having a certain place or way you sit in the classroom when it’s time for a story, or a song you sing when it’s time to wash their hands. Aside from all that wonderful repeated and recycled language in context, familiarity is conducive to confidence. Secure and confident learners are happy learners. And less likely to become disengaged. Yep. This tip is that simple. Make eye contact. Along with learning and addressing learners by name, making eye contact is incredibly important, and in my experience observing others, something often overlooked and/or underestimated. All learners, but especially our little ones, not only want but need to be acknowledged. I’m not talking about glancing around the room with a smile and a nod or a throw away ‘good job’. I’m talking about taking a moment to meet eyes and giving a warm and genuine smile to each and every child in the room, as often as possible. Deep down all VYL want to please the teacher. They are only playing with that leaf they found underneath their shoe because: it’s currently more interesting than you, they are not exactly sure what you want them to do, or maybe they just really like leaves. Sometimes a nod and genuine smile when they behave in the way you want them to e.g. sit in a circle nicely, is all the positive reinforcement needed to win them back / keep them on track. Likewise, when little learners are used to having a lot of eye contact (especially combined with smiles and nods), a stern look and shaking of the head can go a long way. Think of yourself as teaching 1:1 within a group. Just remember to include ALL learners. Songs are not only versatile, they are super sparkly and can reach a young child on so many different levels. Is it pack up time? They make for brilliant timers. Not only is it easy to communicate to learners how long they have to be packed up if they are familiar with the song, they can sing along too! Kylie Malinowska is a teacher, trainer, presenter, writer, sleep- deprived mum of twins and coffee addict. She is the Young Learner Advisor and IH CYLT Coordinator for International House World Organisation and currently based in Prague where she also teaches and trains part-time for International House Prague and Akcent College.